A bulbous perennial with linear leaves and umbels of 2-6 horizontal, open funnel-shaped, red, yellow or pink flowers in late summer. The variety pallidum is a pale yellow-flowered form. To 50cm. [RHSE, Hortus, Baker Am.]. First botanically described as Amaryllis advena by Ker Gawler in 1808 [BM t.1125/1808]. Placed in Rhodophiala by Traub in 1953 [Plant Life vol.9, p.60/1953]. Its origin as a garden plant is unclear. According to Baker Hippeastrum advenum pallidum was introduced to Europe around 1714. [Baker Am.]. 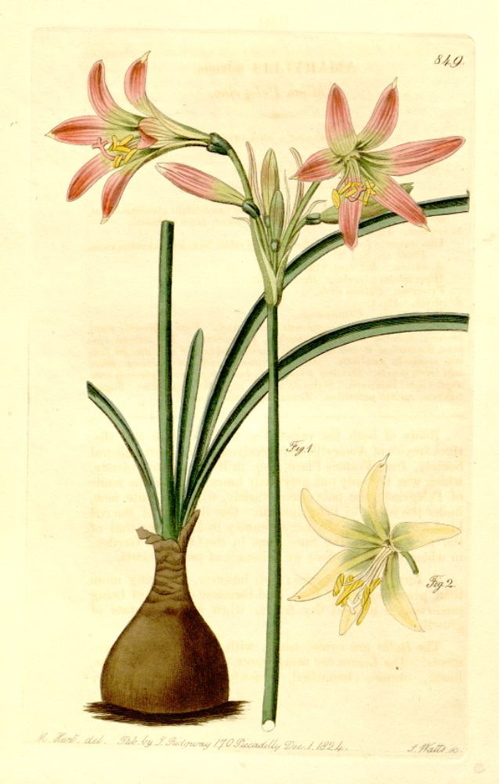 Curtis’s Botanical Magazine figured the type of the species Amaryllis advena: ‘A native of Chili; and until now, we believe, an entire stranger to our European gardens.’ [BM t.1125/1808]. John Lindley commented in the Botanical Register: ‘Roots of both the varieties of this very rare and distinct species of Amaryllis were received, by the Horticultural Society, from Francis Place Esq. in 1822; the red variety, which was the one previously known, under the name of Pelegrina; the pale citron variety, which is quite new, under the name of Pelegrino var.’ [BR f.849/1824]. Loddiges’ Botanical Cabinet figures this plant under the name Amaryllis advena [LBC no.779/1823] and Habranthus pallidus: ‘We received it from our kind friend Mr. George Eglinton, of Valparaiso, in 1830, and it flowered in June 1831. Among the bulbs were others of different colours, ranging between white and red, from which we may infer that it is a cultivated plant.’ [LBC no.1760/1833]. Listed in the 1845, 1850 and 1857 catalogues [B.200/1845]. The origin of this and other South American Amaryllids making their appearance for the first time in the 1845 catalogue suggests that they may have been introduced by John Bidwill when he retured from England in 1844. They were perhaps obtained from William Herbert. Habranthus advenus (Ker Gawl.) Herb. Hippeastrum advenum (Ker Gawl.) Herb.